Comments Alternatively: 他 喜 欢 喝 中 国 茶 吗 tā xĭhuān hē Zhōngguó chá ma or 他 喜 欢 不 喜 欢 喝 中 国 茶 tā xĭhuān bu xĭhuān hē Zhōngguó chá without the emphasis on the question. 呢 ne is placed at the end of a sentence. It can be used in the following situations: 1. 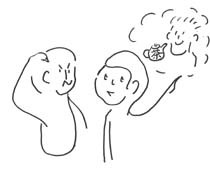 To ask the same question of the person you are having the conversation with, as in: A: 你 好 吗 nĭ hăo ma? how are you? B: 我 很 好. 你 呢 wŏ hěn hăo. nĭ ne? I am very well, and you? 2. As the question word: where? 我 的 书 呢 wŏ de shū ne? where is my book? 3. To reinforce questions formed with a question-word (who? what? which? when? why? where?) and to show that a speaker really wants to know the answer, as in: 他 是 哪 国 人 呢 tā shì nă guó rén ne? what nationality IS he? 你 看 的 是 什 么 书 呢 nĭ kàn de shì shénme shū ne? what book ARE you reading? 你 去 哪 儿 呢 nĭ qù năr ne? where ARE you going?